One more in the “Queens” series. The title for this piece is “Queen of Hearts”. Prints and various products featuring this artwork can be directly purchased through my account at FineArtAmerica. This one had a rather different kind of genesis compared to the rest of my work. So far ideas for paintings came to me by drawing freely until I saw something intriguing I could develop figuratively and symbolically. I never use reference nor photos, except in those cases where I’m completely unfamiliar with a particular subject or detail. This is why I let images come to me first and allow them to take my mind away as far as possible. I used to sketch with the tablet but I moved to sketching on paper because I found the process liberating and refreshing. Nevertheless the process would be the same: I’d sit and draw until I really liked something. Inevitably I discarded many drawings. However this “Queen of Hearts” has a different beginning. I started going to life drawing sessions quite regularly about three months ago. My intention wasn’t to improve anatomy (even though that’s always an advantageous consequence of such practice), but to rediscover form and “seeing” by throwing myself out of my comfort zone. Moreover I did it in order to get new ideas, except that this time I wouldn’t sit alone in my room sketching randomly, but I’d let circumstances help me in the form of a silent dialogue between a model, my mood of the day, my representation of it all and a bit of luck too. This is how one of the many life drawings I did so far happened to look intriguing enough for me to develop it further. 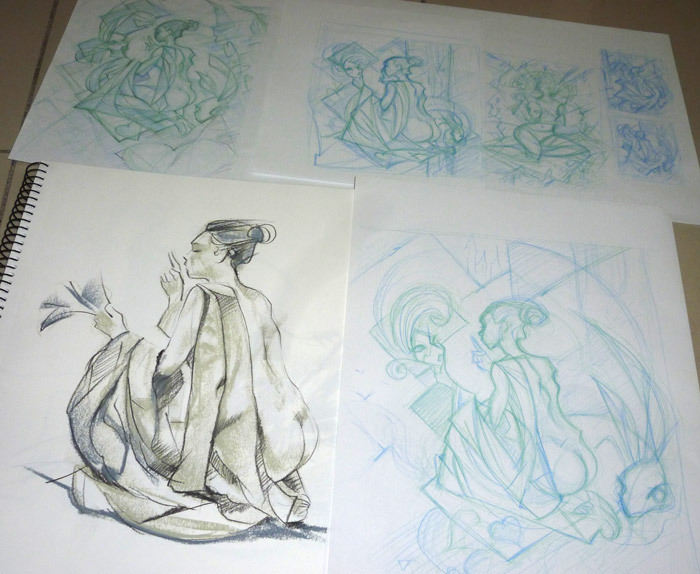 I had to rework it several times until I was satisfied (all my latest works start as several sketches on paper). In the photo below you can see the life drawing itself and all the studies I made before finalizing it (there’s even a little cameo of another idea I was considering developing). It’s not at all apparent but the model was truly holding a Venetian mask I had no time to draw live. The idea of the pose was entirely hers. I found it fascinating. There was much in it of the themes and symbols I enjoy to explore. But why the bunny, you might ask? I’ll leave that discovery to you.